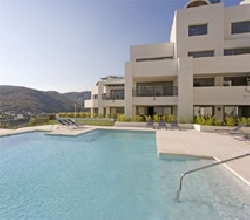 FOR FULL INFORMATION AND PHOTOS PLEASE CHECK OUT OUR WEBSITE AT www.marbellaflat.com. a large lounge/dining room and an additional guest cloakroom. The lounge and both bedroom suites lead directly onto the fabulous terrace with its stunning views. The comfortable lounge is furnished in a contemporary but elegant style. It has leather sofas, a glass dining table with seating for 6, flat screen 32� TV with satellite, and DVD. The modern gas fireplace adds warmth and a striking focal point to the room. The Master bedroom suite has a sophisticated yet comfortable feeling. With a king-size bed, and copious storage this striking, modern room is perfect. Its en-suite bathroom is complete with a huge wall-to-wall walk-in shower and bath. Patio doors open from the bedroom onto the sunny terrace. 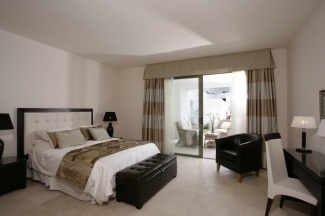 The 2nd bedroom suite has a contemporary French charm with twin beds and en suite bathroom. It also opens directly onto the beautiful terrace. The kitchen is fully equipped. There is a washing machine, dishwasher and fridge/freezer. The built-in oven, microwave, and ceramic hob are ideal if you fancy cooking rather than eating out. The modern white and glass cabinets, with granite worktops, make this a fabulous modern area. There is a breakfast bar with stools, for those relaxed mealtimes. The kitchen leads onto a private courtyard, planted with citrus trees; another area for a snooze or a relaxing read. The most important part of any apartment in Spain is the outside space, and our terrace does not disappoint. Being ground floor allows us the benefit of a huge paved patio with amazing south facing views. It leads directly onto the swimming pool. Furnished with dining table, sun loungers, and rattan suite, this is definitely what the Spanish lazy hazy days are all about. 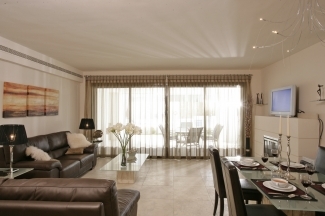 The apartment is located at Los Flamingos, and is situated overlooking the championship PGA golf courses with its luxurious 5 star Hotel Villa Padierna. The outstanding views take in not only the Hotel, Golf course and lake, but also the Mediterranean, Gibraltar and the Riff mountains in North Africa and is surrounded on all sides by beautiful unspoilt countryside. �	Los Flamingos is a resort on the �New Golden Mile�, that ranks as one of the most attractive and desirable developments along the Costa del Sol. Set in a gated community with exceptional landscaping and water features, it is truly enchanting. �	Los Flamingos is 3 minutes from excellent sandy beaches with good �chiringuitos� (beach bars and cafes). �	Supermarkets are at the end of the approach road as is the village of Cancelada. �	The area is packed with restaurants, cafes and bars.
. Only 5 minutes drive to the quaint 'very spanish' towns of San Pedro and bustling Estepona. �	It is only 10 minutes to Puerto Banus and approximately 20 minutes drive into Marbella town and the hillside village of Benhavis. Prices quoted are the minimum rate for that period and vary. Prices quoted do not include school holiday and Xmas and New year.